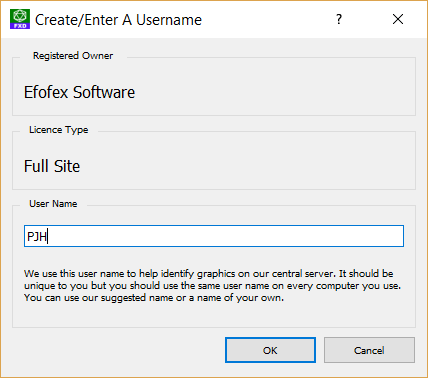 If you are using a full site or distribution license, you will be asked to create a user name on your computer. This is different to the registered name. It is YOUR personal, unique identifier. Some licenses, particularly distribution licenses, are used by hundreds or even thousands of different users. If we did not have a unique identifier just for you, your computer would be downloading the images created by all of them. Your user name makes sure that your computer only keeps your graphics stored locally and makes everything faster. It also means that when you change computers, we can quickly download your data on to your new computer. So What Name Should I Choose? We suggest your initials. It is nice and easy to remember and will make it easier to use the same user name on every computer you use. What If Someone Else Uses The Same User Name? Not a problem. At worst (if they are at the same school as you) you will end up with the other person’s images being stored on your computer. If the other person is at a different school (and using a different license) it will have no impact on you at all. What If I Forget My User Name? Will I Still Be Able To Access My Images? Yes you will. They will just be downloaded from the cloud instead of your local database. This will be a bit slower and means that you will need to be connected to the Internet in order to download your data.